As a kid, there was nothing good about classroom clocks. They either reminded you that you weren't escaping anytime soon, that time was running out to finish that chapter test, or it would slow down in the last 10 minutes of the day. But guess what? 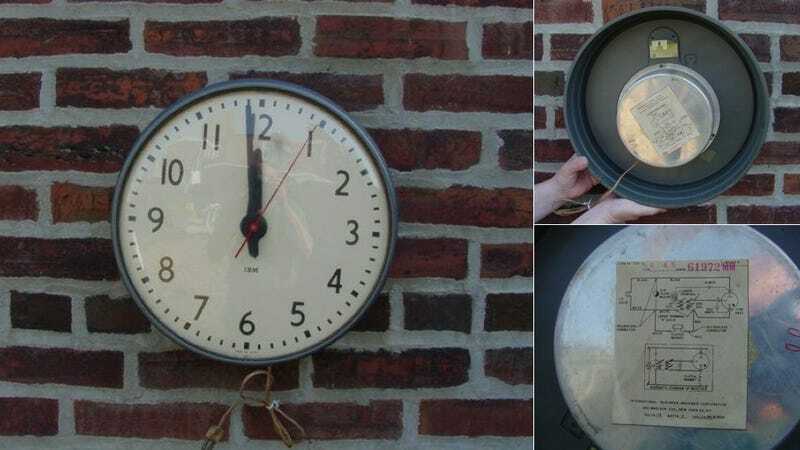 This IBM clock had a clever little secret. You see, besides having having awesome midcentury industrial design, each classroom clock was wired to a central clock on school grounds. According to IBM Collectables, it stayed synchronized to that main timekeeper using magnets. The clock has a 110 volt motor and also has 110 volt clutch magnet. The 110 volt motor is wired to a regular lamp cord for use in the house. The clutch magnet was used in conjunction with a master clock to keep time same as the master clock. The front view of this clock including bezel glass is in prestine condition,so don't rely on the picture as it is showing background reflections.